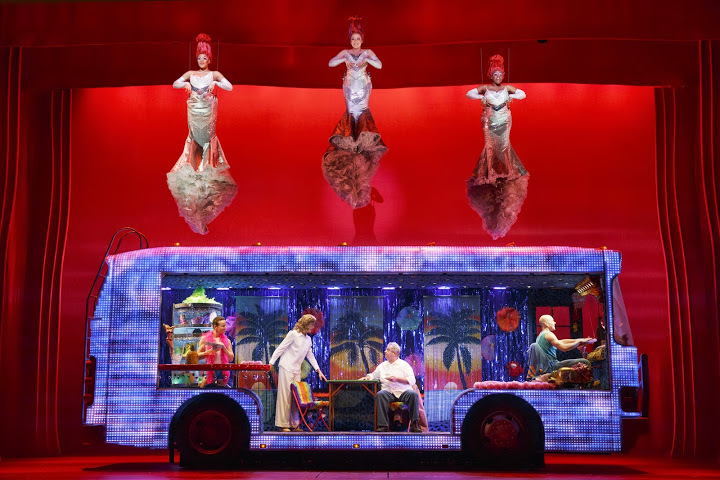 When PRISCILLA QUEEN OF THE DESERT drives in to San Diego, you can expect glitter, costumes, and amazing music accompanying the trio’s trek across the Australian outback. But keep your eyes on the sky as the “Divas” of the show take the air and sing the soundtrack of the characters lives. One of the Divas is Brit West, who flies through the air with the greatest of ease while singing at such hits as “it’s Raining Men” and “I will Survive”. Having toured prior with “Legally Blonde” and the Nickelodeon “Storytime Live!” being an Angel on tour seemed like a fun way to tour! “I’m very excited to get back on tour. I love touring. But it’s also grueling you’re traveling, you’re trying to eat well, you miss your family, you miss your friends. You miss your boyfriend, or you try really hard to have a boyfriend and you never see him. “ Brit says with a laugh. Suspended above the stage, wearing a corset, and a harness, how does one sing and fly at the same time? While it might be hard doing feats of awesome entertainment while traveling from city to city, Brit says she loves touring. “We travel with 50 people in our cast and crew and management; and we hire people locally; it is such a team effort t to make a juggernaut of entertainment! We’ve covered the tour, the tricks, and touring, what about the show itself? Don’t miss your chance to see the awesome musical spectacle that is PRISCILLA QUEEN OF THE DESERT at the San Diego Civic Theatre! Previous Post PSYCH cast talks musical episode and whats next on the theatre horizon!